Coldilocks looks up from a nap during a day of activities marking her 36th birthday in 2016. When the end comes, it's often unbearable. 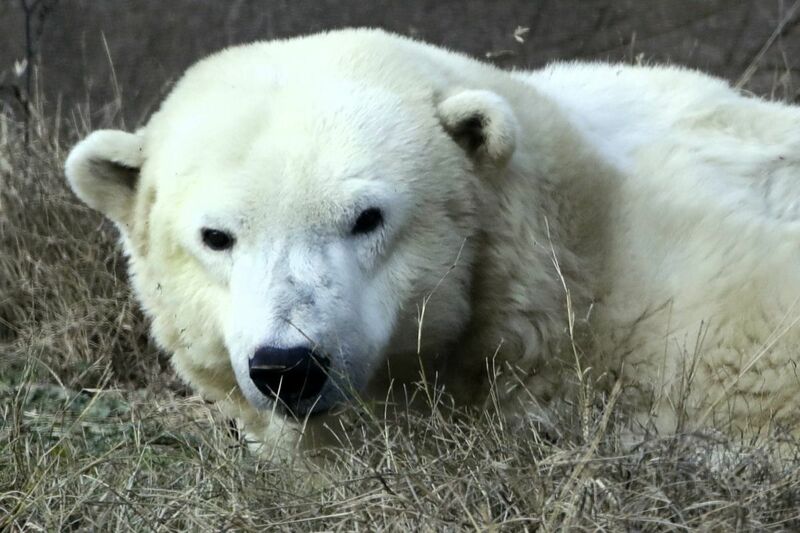 I am saddened by the news that the Philadelphia Zoo's remaining polar bear, Coldilocks, has died. Coldilocks, at age 37, was the oldest bear in captivity in the U.S. I went through this grief before when her sister, Klondike, died at age 35 in 2015. It’s hard to imagine that there was once a time that there were no polar bears at the Philadelphia Zoo — and I feel fortunate to have been a part of the Philadelphia Zoo’s true fairy tale about how that all changed. It all began when a friend who worked at the zoo told me how they purchased new animals. I worked in public relations and my ad agency represented the makers of Klondike Ice Cream Bars. The polar bear mascot was on Klondike Ice Cream bars, but there were no polar bears at the zoo. Inspiration struck, and I was on a mission: I was going to buy polar bears for the zoo and name the first one Klondike! When I told the owner of my ad agency about what I had up my sleeve, he asked me if I was nuts and said something like, "We buy print, radio and TV advertising for our clients, not polar bears." But I was undeterred. "It will be great PR," I promised, with bravado. I enticed our client with the excitement of buying polar bears for zoos in every city that had Klondike Ice Cream Bars, but no polar bears. I said, "There should be a Klondike in every zoo." It sounded magically possible. When I mentioned buying polar bears to anyone who would listen, most asked, "Can just anyone buy polar bears?" or "How much does a polar bear cost?" If I had a nickel for everyone who asked those questions, I'd be retired today. Let's just say at that time, they were more affordable than you would imagine, and our client said "yes." Just like in any true fairy tale, there were some bumps along the road. We were distraught as the first three polar bear babies arrived at the zoo, then unexpectedly died from a few different ailments during their first few months in residence. Then, the next three polar bear babies became two, after one sadly perished in transport. Daily News clipping from October 3, 1981. But good news was just around the corner. Zoo employees (and our client) rejoiced when the remaining two furry babies settled in and were healthy, happy, playful, and enchanting. Bear #1 was ceremoniously named Klondike, on behalf of her benefactors. Bear #2 was christened Coldilocks, through a six-week long Philadelphia Daily News "Name the Bear Contest. Her winning name was submitted by a classroom of Catholic school children, thereby winning their school one thousand Klondike Ice Cream Bars, countless family memberships to the zoo and other prizes. The Daily News said it was their most successful contest ever held at that time. Klondike, in background, and Coldilocks at the Philadelphia Zoo, on Weds., May 14, 2008. Klondike and Coldilocks, Philadelphia's majestic, gentle giants were natural clowns who frolicked year-round in front of hundreds of thousands of happy families and zoo visitors from around the world, outliving their age expectancy. According to polarbearsinternational.org, wild polar bears (Ursus maritimus) are considered long-lived animals that in the wild and can live an average 15 to 18 years; biologists have even tagged a few bears in their early 30s. But in captivity, few bears reach their mid-to late 30s with their maximum lifespan rarely beyond 25 years. Philadelphia's polar bears made history and it's now the end of an era. At the end of this fairy tale, we hate saying goodbye to beloved Coldilocks and Klondike, who were in our lives for a very long time and became our friends. However, we are grateful to have been a part of their story, and the legacy they left behind at the Philadelphia Zoo, and in our hearts.